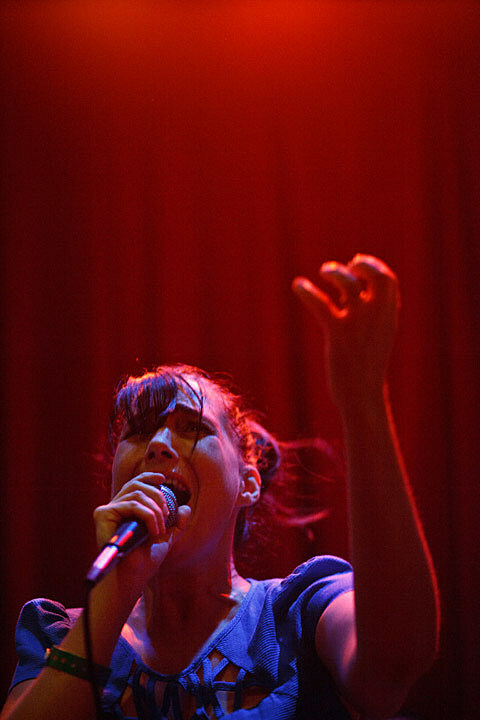 Kathleen Hanna, previously of Bikini Kill and Le Tigre, is back at the mic for a new band, The Julie Ruin (named after her 1998 solo album), who make a good mix of the sounds Kathleen has experimented with throughout her career. Their debut album is out today (have you streamed it?) and they’re playing a sold-out show at Bowery Ballroom to celebrate. Openers Swearin’ make scrappy, honest pop punk, and they’re not to be missed either. The Julie Ruin will also be back for a Music Hall of Williamsbug show on October 25. Abstract rapper Beans released his new collaborative EP with Mux Mool today, and he’s celebrating that in Brooklyn with a release party at Glasslands. Mykki Blanco collaborator Gobby is worth seeing too. Tonight Pianos hosts a number of musicians you’re probably familiar with playing with projects you may be less familiar with. Seth Olinsky of Akron/Family headlines the night with his new riff-heavy project Cy Dune, Greg Saunier of Deerhoof is on the bill with his band MEMS, and Lorely Rodriguez (Empress Of) and Sam Owens (Celestial Shore) make up the duo Young and Often, who open the show. Sibling trio Haim have spent most of the summer on the festival circuit, honing their live skills, doling out catchy, harmony-laden pop, and giving folks a taste of their debut album, Days Are Gone, which is out at the end of the month. Tonight’s sold-out show is with IO Echo who you may have caught at Warm-Up over the long weekend. Before Neutral Milk Hotel heads on tour, Julian Koster is doing one last run of shows for his band The Music Tapes at 133rd St. Arts Center Lab. Tonight’s the dress rehearsal, and it’s the first of five appearances this week. Free but RSVP is closed. One of the many ex-Titus Andronicus members, Andrew Cedermark has been operating as a solo artist for a few years now, and has a new album out this year. Dr. Dog announced this show at the last minute and it sold right now, so if you’ve got tickets, you’ll be getting a chance to see them in a pretty intimate environment before they tour with The Lumineers. Late show (10:30 PM). This show is only open to those with an NYU student ID, and while the lineup is technically a mystery, clues have led us to believe the lineup is Danny Brown, How To Dress Well, and Speedy Ortiz.